Do you have any investment questions and answers you would love to ask or have answered for free? Here on the Investment Questions and answers page you can ask any question you want pertaining to Investments of any kind. You may also give investment advice to others and learn more about the best ways to invest your money. In response to the amount of questions I have been receiving regarding investments, I decided to start this page to answer any investing questions you have about investing your money. Rather than answering ongoing individual questions, this will give everyone a chance to read about the universal questions that others have about investing also. This will become a FAQ about Investments that will be beneficial to everybody. There is a lot of valuable information to be found here. How to invest, where to invest and what to invest in can be extremely daunting and it can be overwhelming trying to figure out exactly what makes for a good investment opportunity, It is scary not knowing whether or not you are investing wisely and it is always helpful to be able to validate your findings. This investment Questions and Answers forum will be a great help with that. The advice I give is only from my experiences, and I don't have experience with everything. So, if you are a business professional, a personal or professional investor who has experience with any of the questions you find here, please help me by also contributing to the answers. This is a two way web page...you and me. You can ask a question, answer a question or do both. 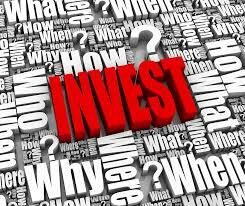 You will become my co-expert on these investment questions by rating and submitting comments. The more interactive the better! Of course you can still contact me if you have a question that you feel would not benefit others or needs a personal response. The tax questions found here have been broken down into subcategories for greater ease of use. There will also be separate pages to ask income tax questions and bookkeeping questions as well as many other question categories that you will find listed below. In addition to being able to ask a question about your bookkeeping problems, you can also read previous bookkeeping Q&A's on that page as well. All of the information found on the bookkeeping questions page has been broken down into subcategories. All other questions about any aspect of income taxes can be asked just below, on this page. Ask questions about any area of investing. You can even answer questions that have already been asked. It's free, it's easy and it's fun. This is for everyone to participate in. Let's all help and be helped. Don't forget to check back soon to view the answers. I'll do my best to give my personal reply or post for others to answer within 24 hours. You can also upload a photo if you want to show the problem. Sometimes it helps to see what you are talking about, but it's not absolutely necessary. What is going on with Amazon investing into the PillPack online pharmacy?